We encourage investors to consider using tax-advantaged accounts for mortgage REIT preferred shares. We opt to trade preferred shares frequently where the downside is extremely unlikely. AGNCB is great for buy-and-hold investors and traders but not at the current price. There are a few ways to miss out when looking at preferred shares. One way is to pass on a very attractive security because investors refuse to own anything at a price higher than par value. If investors absolutely refuse to pay $25.01, they will pass on several great investment opportunities. Rather than treating all securities that trade above par value as being useless for investing, investors should be prepared to amortize the premium over the life of the security. Being stubborn does not change the facts. We cover AGNC Investment Corp. (AGNC) occasionally, but we find their preferred shares are far more interesting for investing. The preferred shares carry a lower yield but offer a much more stable price. We recently suggested AGNCB (AGNCB) as a solid choice. Since that rating, the yield to call turned negative as shares went ex-dividend. When we highlighted AGNCB for investors, shares were trading at $25.49. However, they were about to go ex-dividend for $.48. The result was investors would have an effective cost of only $25.01 thanks to the dividend. These differences may appear minor, but they are an important part of mitigating call risks. When the yield to call is positive, AGNCB is generally a good investment. When it turns negative, the shares become less appealing. A slightly negative yield to call can still be worth the risk, but the potential loss needs to be very low. We encourage investors to consider using tax-advantaged accounts for mortgage REIT preferred shares, so tax considerations become a non-issue. That wouldn't work if the shares paid UBTI (unrelated business taxable income), but mortgage REIT preferred shares don't pay UBTI. Some investors may want to use this as a buy-and-hold position. 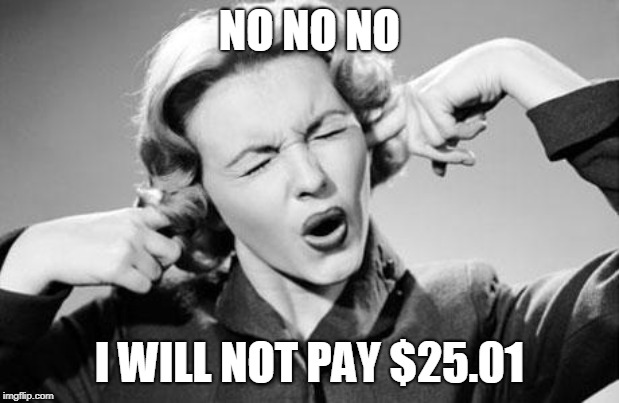 That's perfectly acceptable, but they are much better off if they entered at $25.49 before the shares went ex-dividend. At $25.20 today, shares carry a negative worst-cash-to-call. If a call was announced for the first possible date, investors would have a negative total return. The metric worst-cash-to-call is another way of looking at the yield to call. Instead of annualizing out the values, we simply look at the total return that would be achieved if shares were called immediately. That allows us to control for shares that have materially different amounts of call protection left. Losing 0.3% in total returns on one investment in one month isn't going to wreck returns. It is bad, but it won't have a huge impact if the performance isn't repeated. An investor who loses .3% on an investment held for 7 years would've done far worse, despite a smaller annualized loss. The second investor has lost the opportunity to make money for 7 years. We opt to trade preferred shares frequently and felt this was a solid opportunity for that kind of trade. The upside was very limited, but the downside was extremely unlikely. Shares of AGNCB simply don't dip that far. When the market sells off, AGNCB hardly flinches. Why Doesn't AGNCB Move With the Sector? AGNCB's coupon rate of 7.75% gives it a yield of about 7.70% despite trading a slight premium to the call value of $25. Since AGNCB is such a low-risk share (excluding call risk), it is extremely difficult for shares to touch $24.00. At that price, shares would be incredibly attractive. Consequently, investors step in with a strong bid to support the share price. We opted to use our shares of AGNCB for a dividend capture. In March, the yield to call was positive as shares had a positive worst-cash-to-call. We predicted that they would move to trade at a negative worst-cash-to-call after the dividend. That makes sense to us because the most comparable shares are NLY.PD and NLY.PC from Annaly Capital Management (NLY). Those preferred shares regularly trade at a negative worst-cash-to-call. When shares were at $25.28, they had a negative worst-cash-to-call at minus $.16. That's within the normal range for NLY.PD and NLY.PC, but it is more risk than we wanted to take on. Buy-and-hold investors may choose to hold on and that's okay. While we don't like the call risk, everything else about the share is attractive. It's an excellent fit for many investors and we would be happy to own it again. When the share price and dividend accrual are creating a little protection from the call risk, that's a great time for entry. We expect AGNCB will trade within a very narrow price range due to the call risk. Shares are too good to trade much below a stripped price of $25.00, but the call risk is too high for them to trade much above it. The REIT Forum is the #1 rated service on Seeking Alpha. We compare our performance with VNQ and PFF. 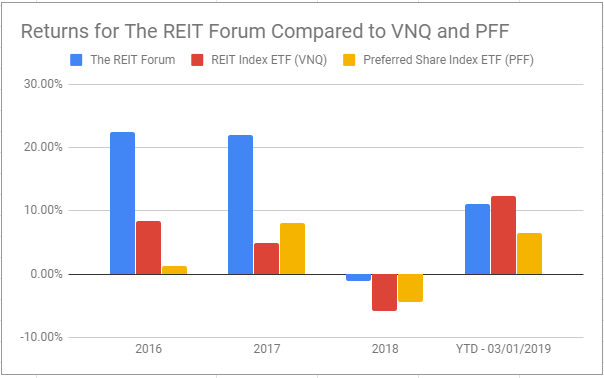 VNQ is the largest REIT ETF and PFF is the largest preferred share ETF. We want to demonstrate superior performance relative to the index ETFs. Try a Free 2-week trial today. Disclosure: I/we have no positions in any stocks mentioned, but may initiate a long position in AGNCB, NLY.PC, NLY.PD over the next 72 hours. I wrote this article myself, and it expresses my own opinions. I am not receiving compensation for it (other than from Seeking Alpha). I have no business relationship with any company whose stock is mentioned in this article. Additional disclosure: We don't anticipate entering a new position in any of the preferred shares mentioned here, but that is because we don't anticipate a sudden dip in the price. If share prices dipped, we would be happy to acquire them.